CC Sabathia of the New York Yankees and co-host, Ryan Ruocco, welcome athlete and celebrity guests to the plate for wide-ranging conversations. R2C2 is UNINTERRUPTED as CC & Ryan welcome Yankees bullpen coach Mike Harkey. CC and Hark discuss bonding over breakfast and BET, Andy Pettitte stories, and who is the biggest sports nut on the Yankees roster. All this and more on R2C2! R2C2 is UNINTERRUPTED as CC & Ryan catch up on all things Yankees, NBA, GoT, and more. Ryan reads your Twitter questions, CC discusses the Yankees slew of injuries and the outlook on his return to rotation. Plus, the guys predict who they think will sit on the Iron Throne. All this and more on a brand new edition of R2C2! R2C2 is UNINTERRUPTED as CC & Ryan welcome Yankees second baseman Gleyber Torres to the show. Ryan describes Gleyber as the best storyteller R2C2 has had. Gleyber gives out the Yankees clubhouse "Best Dressed" award. He discusses adjusting to life in the U.S., the importance of learning English and getting traded from the Cubs to the Yankees. All this and more on R2C2! R2C2 is UNINTERRUPTED as CC & Ryan welcome J.A. Happ and James Paxton to the show. The veteran left-handers discuss the southpaw bond they share with CC and Yankees special advisor Andy Pettitte, what they do on their days off, no-hitters, bald eagles, and bad Florida drivers. All this and more on R2C2! R2C2 is UNINTERRUPTED as CC & Ryan welcome Yankees pitcher Adam Ottavino to the show. The native New Yorker discusses his NYC roots, being at Doc Gooden's no-hitter, and facing Ryan in high school. Adam explains the origin of his signature breaking ball (not slider), and the guys nerd out over their love for Star Wars and Game of Thrones. All this and more on R2C2! R2C2 is UNINTERRUPTED as CC & Ryan welcome 5x All-Star Troy Tulowitzki to the show. The veteran shortstop opens up about signing with the Yankees, overcoming injury, and constantly proving people wrong. Troy and CC bond over their Bay Area roots, and the guys are surprised with the connection Troy has with Terrell Davis! All this and more on R2C2! 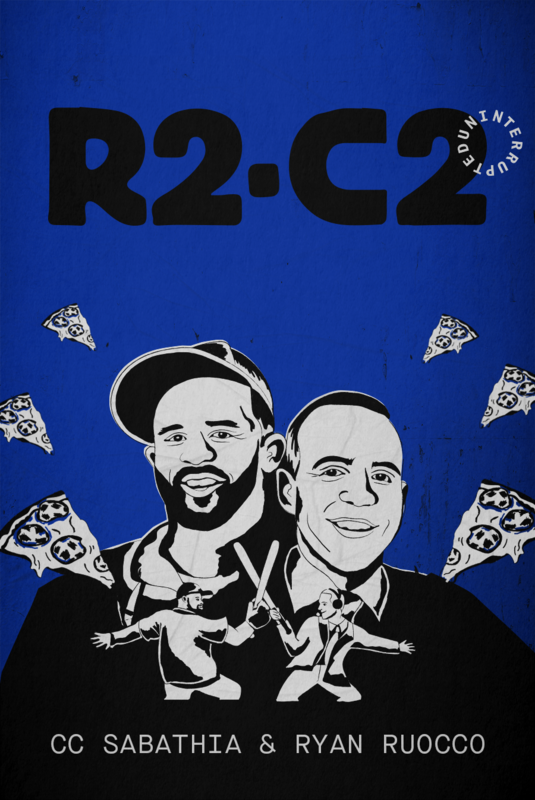 R2C2 is UNINTERRUPTED as CC & Ryan pull off their first podcast from two different locations. While CC is in Tampa preparing for Spring Training and Ryan is back in New York, the guys hop online to bring you a new episode of your favorite podcast. Spring Training prep, fan questions, NBA drama, they cover it all. R2C2 is UNINTERRUPTED as CC & Ryan sit down with the OG podcaster and former NBA champ, Richard Jefferson. The guys talk about what it's like playing with LeBron, how Richard and Channing started the very first athlete-hosted podcast (shoutout to Road Trippin') and RJ tells some amazing stories about Gregg Popovich. R2C2 is UNINTERRUPTED as CC & Ryan sit down to talk Jay Z, Twitter trolls, Yankee's offseason moves and if CC is ready for retirement. Sit back, relax and hang with your favorite podcast duo! R2C2 is UNINTERRUPTED as CC and Ryan sit down with their good friend and returning guest, Jerry Ferrara. Jerry tells us all about his involvement in the NBA2K league and how it's evolved. Then, with a baby on the way, Jerry and the guys talk parenting and growing up playing sports. Plus, a story about Tom Brady's guest appearance on Power that you do not want to miss!